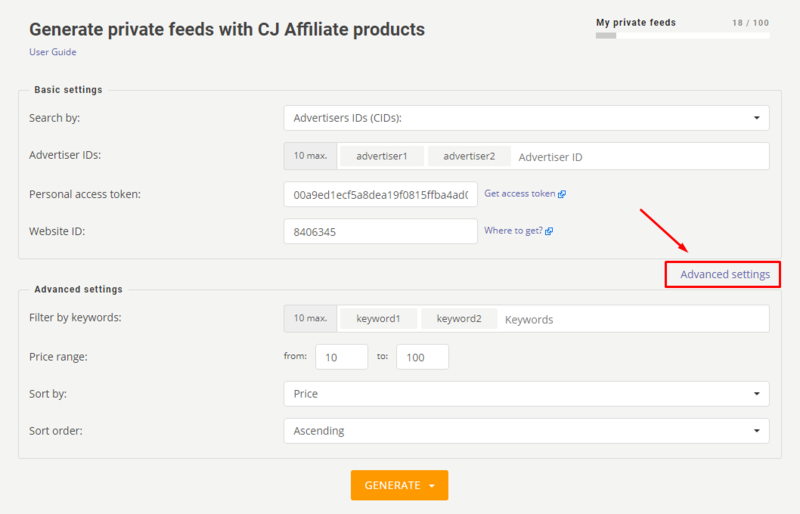 With CJ Affiliate Feeds generator you can search for targeted CJ Affiliate products using your keywords or advertisers IDs. Search results will be combined into a self-updating content feed which will show all latest CJ Affiliate products related to your search. Your CJ Affiliate affiliate ID will be automatically embedded into product links. You can start promoting CJ Affiliate products right away and earn your fair commissions. 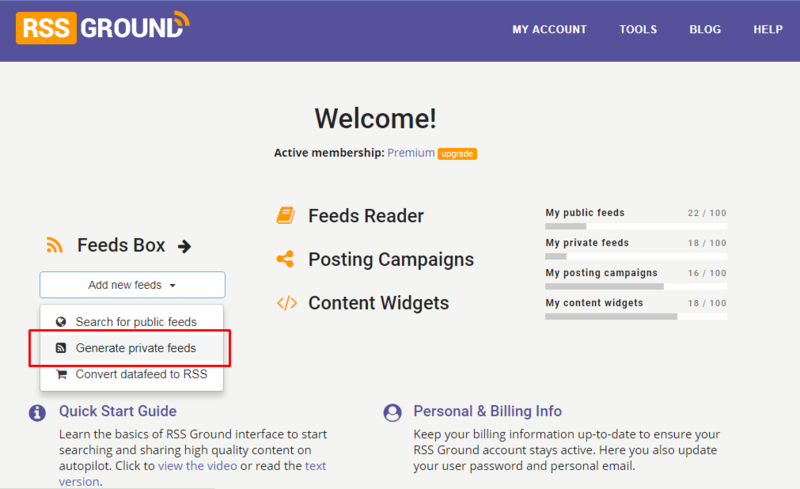 To use CJ Affiliate Feeds generator you need to sign up for any of RSS Ground membership plans. CJ Affiliate feeds are Private content feeds. The number of active Private feeds may be a subject to limitations according to a chosen RSS Ground membership plan. or on MY ACCOUNT page use Add new feeds - Generate private feeds option, and click CJ Affiliate Feeds logo. CJ Affiliate Feeds generator has Basic and Advanced settings. Advanced settings are optional and are used for a specialized search. At the same time, you can use only basic settings to search for targeted CJ Affiliate products. All Basic settings are mandatory. Here you specify your Personal access token and Website ID. Also here you choose if you wish to search all CJ Affiliate advertisers or generate a feed with products from Advertisers which have approved you for their affiliate programs. If you wish to generate a content feed with products from specific advertisers you choose Advertisers IDs option. You can specify up to 10 different advertisers at a time. Use Setup posting campaign option to start sharing content from CJ Affiliate feeds right away. Whatever option you choose your new CJ Affiliate feeds will be also saved to your Feeds Box. To search for targeted CJ Affiliate products you can use only Basic settings. Advanced settings are optional. Filter by keywords - only products which mention at least one of specified keywords in title or description will be included in the feeds. Price range - you can limit your search results by a minimum and maximum product price. Here you enter only integers. Title - sort products alphabetically considering product title. Price - sort products in regards to their price. Manufacturer - group products from the same manufacturer together. Sort order - choose if you wish your products to be sorted in ascending or descending order. What is CJ Affiliate website ID? How to sign up for CJ Affiliate? What is CJ Affiliate advertiser ID and how to find it?